The chili purists bicker about beans, no beans, veggies, no veggies, whatever. This recipe is not for them. They’d flip out over this one. It’s smoky, meaty, tomato-y, all the things a good chili should be–but it’s vegetarian. 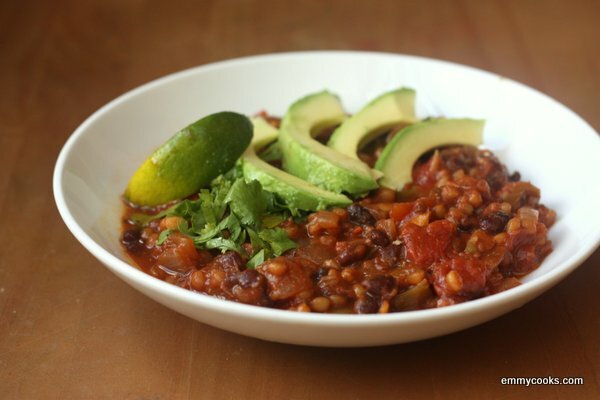 This is a secret, shh, but this chili has wheat berries* in it. I know, it’s crazy. But they’re great. They are combined with black beans to give the chili texture and rib-sticking density, while the flavor is anchored by chipotles and cumin and elevated by lime and cilantro at the end. This is my go-to winter chili. To make this Winter Vegetarian Chili, start by cooking about a cup of wheat berries in water to cover by an inch and a teaspoon of salt. (Cooked wheat berries freeze well, though, so why not make more while you’re at it?) Bring them to a boil and simmer for about an hour, until pleasantly chewy. Meanwhile, get your chili going: saute a chopped onion with a chopped red pepper for a few minutes, then add 5 minced cloves of garlic, 1 tsp. oregano and 2 tsp. each of chili powder and cumin. Once the spices start to get toasty, stir in 1-2 tsp. of pureed chipotles until fragrant (I buy canned chipotles in adobo and puree the whole can with the adobo sauce; the puree keeps in the fridge forever, as far as I can tell). Then add a big can of chopped tomatoes, 3-4 c. of cooked or canned black beans (with some of their liquid, if you cooked them yourself), some of the liquid from the cooked wheat berries, a Tbsp. of brown sugar and salt and pepper to taste. Simmer for a while and then add your drained cooked wheat berries and cook for a few minutes longer. Squeeze in a whole lime at the end. I first found this recipe in Eating Well, which basically means it’s health food. But don’t let that stop you from topping your bowl with some grated cheese and sour cream in addition to avocado, a lime wedge and cilantro. And you can never go wrong with a chunk of corn bread. *What’s a wheat berry, you ask? It’s the whole wheat kernel, it looks a little like brown rice, and it cooks up into a nutty, chewy, delicious little bite of good-for-you-whole-grain. Wheat berries make great salads, I’ll tell you about that another time. And when you’re shopping for them, pick hard red wheat berries instead of soft white ones–but if white wheat berries are all you have, don’t worry, they’ll work just fine. This entry was posted in Beans and Other Legumes, Easily Multiplies to Feed a Crowd, Mexican Flavors, My Favorite Recipes, Vegan or Would-Be-Just-As-Good-Vegan and tagged cooking, dinner, food, lifestyle, recipes, soup, vegan, vegetarian on January 15, 2012 by emmycooks. That looks delicious and something to be enjoyed with some amazing home made bread and whether you use vegan or real sour cream, I think its a given that this chilli is a winner!